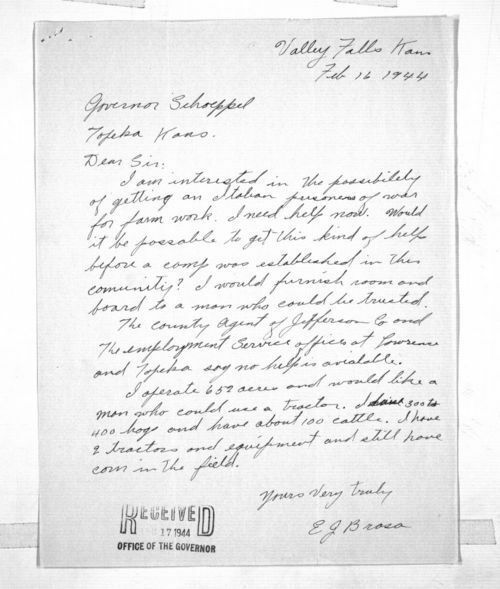 E. J. Brosa, a farmer living near Valley Falls (Jefferson County) writes to Governor Andrew F. Schoeppel of Topeka (Shawnee County) requesting an Italian prisoner be sent to his farm as a laborer. The United States military held Axis prisoners of war at internment camps at several locations in Kansas. The use of war prisoners as farm laborers was a controversial issue for local communities. Some citizens worried about personal and community security and the protection of military intelligence. Other citizens were concerned about the shortage of farm labor and resented Axis prisoners being allowed to work their farms while their children were off fighting the war.